Midway through squeezing into our wetsuits, I remember my wife pausing mid-laugh to reflect, “It’s going to be cold.” If we were looking for a sand-between-our-toes, poolside-daiquiris type of Florida vacation, this wasn’t going to be it. But that’s not why we go to Crystal River. 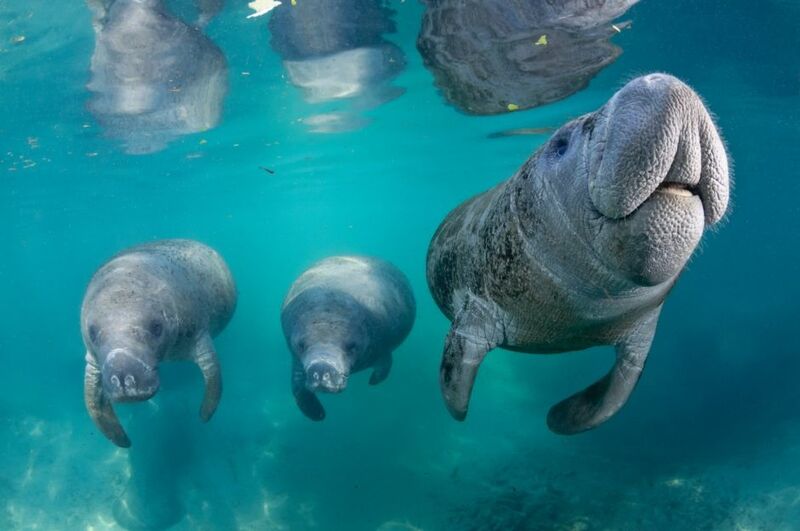 Self-dubbed the Manatee Capital of the World, the Crystal River area is just that — home to hundreds of manatees who rely on spring-fed Kings Bay to keep warm during the winter. 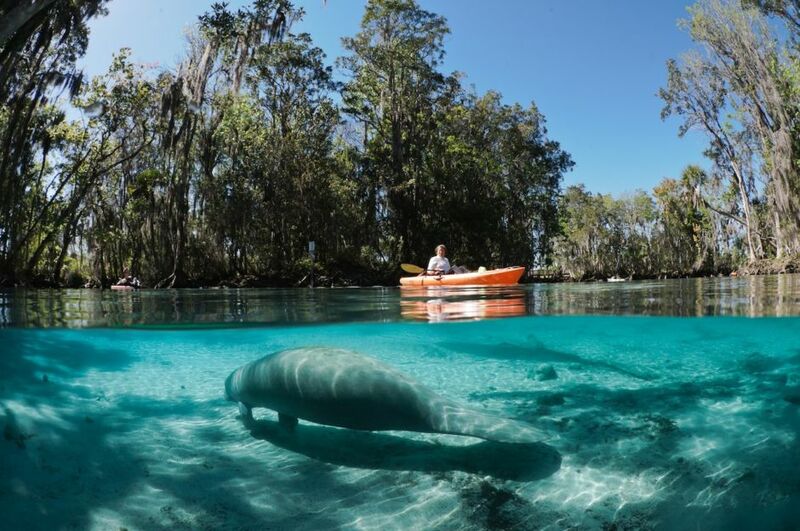 While you could search and find manatees up and down the Florida coast, Crystal River and Homosassa stand alone as the only places in Florida where you can legally enter the water and interact with manatees in the wild. That’s why we go. Of course, it’s easy to wade into the bay with a pair of goggles and a little enthusiasm, but that only guarantees you’ll get wet. 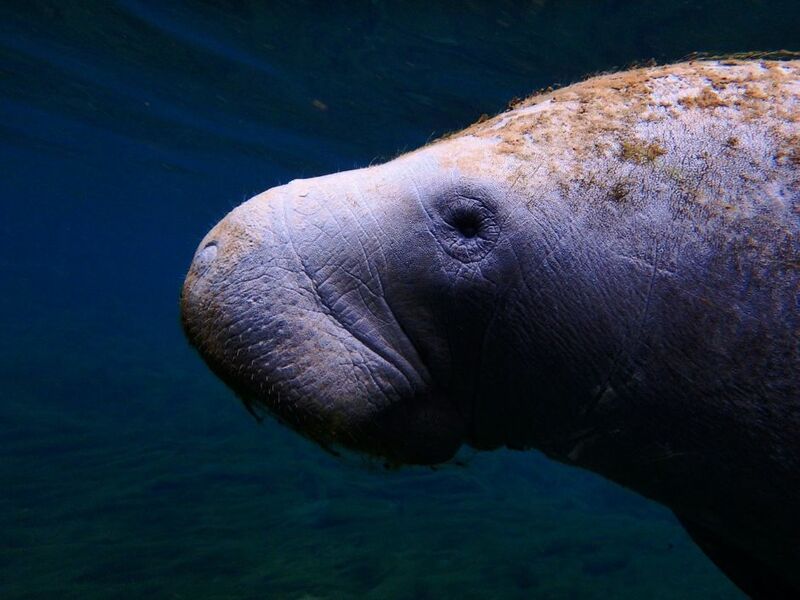 Here’s what you need to know to see some manatees, learn a little, and get home happy. Instead, time your trip to the Crystal River area for November through March, when cooler temperatures arrive. Wintering manatees are near the northernmost part of their range here. Despite reaching weights of more than a thousand pounds, manatees can get hypothermia, just like humans. Springs at Crystal River National Wildlife Refuge on Kings Bay flow at a consistent 73℉, giving manatees a warm refuge. All that to say, the colder the better for manatee viewing. You can choose to see manatees from a boardwalk or spot them from the side of a boat, but to swim with manatees is definitely unique. That also means you need a plan. If you want to experience Kings Bay at your own pace, go by kayak and bring a map. You’ll want to know where King Spring, Three Sisters Springs, and Hunter Spring are located, as well as the off-limits Manatee Protection Zones. Ask a local dive company for a map you can use (many of these companies also rent kayaks), and try to find an outfitter that lets you park, rent, and access a launch site. Otherwise, launch your kayak at Hunter Springs Park or Kings Bay Park, and don’t forget a rope to tie up your kayak as you swim. It may seem like you don’t need any extra gear to swim with manatees. After all, the water temperature is 70+ degrees and the spring weather is clear. While that’s true, good gear will let you stay in the water longer. A wetsuit will keep you warm, flippers get you moving, a pool noodle will keep you buoyant so you don’t kick up sediment, and — of course — a mask and snorkel are essential when you’re face down in the water searching for manatees. Important note: Before you ever get in a boat or in the water, you need to watch the Crystal River National Wildlife Refuge’s Manatee Manners video. This video produced by the U.S. Fish and Wildlife Service teaches you the do’s and don’ts of interacting with manatees and is required viewing before renting a kayak or otherwise participating in this unique wildlife experience. …or just go with the experts. I’ve lost track of how many manatee tour and dive companies operate in and around Crystal River. That’s not a bad thing. Locals know where to go, what to do, how to act, and they can teach you all you need to know to have a successful experience. Though remember that, ultimately, it’s your responsibility to learn and understand the rules. Some tours travel by kayak, but most go via boat. Motorized craft allow you to get in the water faster and provide a dry place to rest and throw on a jacket when you’re out. The average tour costs about $65, lasts three hours, includes an educational talk, and comes with all the gear you need to be safe and comfortable. A good tour gives you peace of mind, knowing that all you need to do is show up on time and follow directions. Each company tries to set itself apart. Most of the special offerings are nice, but not essential. If you shell out for a VIP-type tour, pick one that stays out for longer, upping your chance of a great manatee experience. Or pick a less-popular tour location, like the River Safaris snorkel tour in Homosassa Springs. Other worthwhile perks include tour sizes of six or fewer people, in-water tour guides, and social-media-worthy pictures of you swimming with your new manatee friends. Don’t be surprised when you feel a connection with every manatee you see. Even though you’ll probably want to dive down to them as soon as you spot them, check that natural impulse. Instead, keep your Manatee Manners front of mind. In 2017, manatees were moved from the endangered species list to the threatened species list. That’s an improvement, but it’s not a free pass to misbehave. As a visitor in their natural habitat, it’s important that you avoid putting the manatees in stressful situations. The key phrase in these parts is “passive observation.” Let the manatees take the lead. If a manatee approaches and touches you, you’re legally allowed to use one hand to reciprocate. Otherwise, you’re there to passively observe — and extremely lucky to have the chance to do so! Again, you’re expected to know these regulations before getting in the water. Not abiding by them could result in a very sharp warning from Manatee Watch volunteers — or even a fine. People here feel very protective of the manatees, and boat captains, in-water guides, and concerned residents won’t hesitate to speak up if swimmers engage in inappropriate behavior. Remember, this is their home! My first time swimming with manatees started as a bust. It was a cold day (good), but we had no wetsuits (bad). For a chilly, quiet hour, we kicked around Three Sisters Springs watching tiny, colorful fish dart from log to rock to log with a sleek black anhinga in pursuit. A belted kingfisher chattered above us as it looked for an unwitting fish-turned-meal. Turtles scuttled across the ground. We were entertained, but hoping the whole time that mounds of dirt below would suddenly reveal themselves as camouflaged manatees. Nearing our limits with the cold, we noticed a crowd had formed in the canal near our kayaks and the Manatee Protection Zone, where we were greeted by three resting manatees. Success! We played the waiting game and won. It’s hard to imagine a comparable wildlife interaction, one that was at the same time exciting, natural, and safe. Since then, we’ve fine-tuned our approach and haven’t struck out. Sometimes it takes hours, sometimes we stop at multiple springs, but it’s always an experience. Any uncertainty acts as a friendly reminder that manatees are wild animals that don’t operate on our schedule. Not just any wild animals, but gentle giants that seem just about as happy to be with us as we are with them. Newer PostHow friendly are manatees?